This models represents a rack and pinion gear. The connection to the pinion gear is through the rotation port p_rot. The connection to the rack is through the translation port p_trans. The model is ideal, i.e. there is no compliance nor inertia nor backlash. In this model the pinion bearing is connected to the fixed world and the rack is free to move. This in contrary to the model FixedRackPinionGear where the pinion bearing is free to move and the rack is connected to the fixed world. The rack position is determined by the internal variable x. 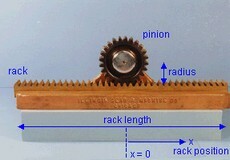 For x = 0, the pinion gear is at the middle of the rack. When the pinion crosses the end of the rack, i.e. a warning is given, "WARNING: rack length has been exceeded at the rack and pinion gear! ", and the simulation is stopped. Internal variable which denotes the rack position, abs(x) < rack_length/2 else simulation halted. This models represents a fixed rack and pinion gear. The connection to the pinion gear is through the rotation port p_rot. The connection to the rack is through the translation port p_trans. The model is ideal, i.e. there is no compliance nor inertia nor backlash. 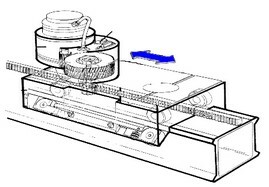 In this model the pinion bearing is free to move and the rack is connected to the fixed world. This in contrary to the model RackPinionGear where the pinion bearing is connected to the fixed world and the rack is free to move. The rack position is determined by the internal variable x. For x = 0 the pinion gear is at the middle of the rack. When the pinion crosses the end of the rack, i.e.